Stash Building & Needful Things? Do you have a needlework wish list? Oh, c’mon…. you know you do! Are you hankering to try some new threads, like fine silks, some crewel wool, some cotton floche or coton a broder? Do you need a good hoop? Maybe one of these sit-on hoop stands is on your list? Update 2017: Joady, the owner of Hedgehog Handworks, retired in 2017, and regrettably, the shop is no longer with us! Hedgehog Handworks is having their Shipping Sale right now! They’re offering free domestic shipping (U.S.) and half price international shipping on all orders placed between now and August 31, 2015. Saving on shipping is a pretty big deal for those of us who live in rural areas or in cities that don’t sport a local needlework shop. Since sales on embroidery supplies are usually pretty rare, I’m always on the lookout for them, or for good shipping deals. This is about the best shipping deal you can get! Hedgehog has some new items in, too. They’re carrying Soie Tressage, a new line of tiny silk braids that can be used in soutache embroidery, stumpwork, or even for finishing. I’ll show you some of these up close in the future. I’ve been dying to play with them, and I’m happy to see they’re out and available. They carry a wide selection of needlework tools, including Hardwicke Manor hoops in various sizes and shapes, tambour embroidery tools, and beautiful Dovo scissors. And then there’s my favorite page on their site. They carry a great selection of hand embroidery linen – that is, linen that’s perfect for surface embroidery. You can buy the linen in fat quarter cuts, which are good-sized chunks of fabric, perfect for several small projects. Anyway, in case you don’t get Hedgehog’s newsletter and you didn’t know about the free shipping sale, I thought I better let you know about it. Every little bit helps! After all, what you save on shipping means … more thread! Hooray, I do like the linen from Hedgehog’s and the hoops, but you can’t buy Hardwicke Manor hoops here in the UK so that is great news. I’ve not heard of Soie Tressage thread before I shall have to look at that, I can’t wait for you to show us the thread braids and what it is used for that will be interesting. I shall have to browse their site. 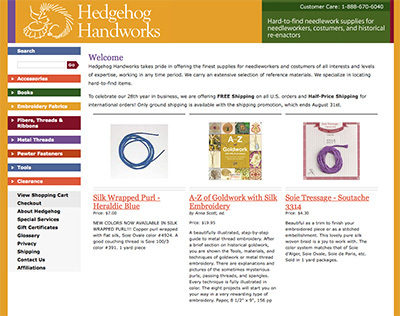 Thanks for the information on Hedgehog’s postal sale and for sharing this with us. Well, gee thanks, Mary! For two days I’ve been carefully avoiding opening that email from Hedgehog Handworks, hoping to avoid the temptation to add to the stash. But you snuck it in on me, and now I’m hooked. I’ve never worked with silk thread before, but I’ve recently begun a crazy quilt and… And that silk-wrapped perle sounds interesting, too. Ah, the temptations abound. I have been using DMC satin flosses in place of twisted silk threads, and, even though I still have to order it online, I can know exactly which shade I’ll be getting because it is the same shade as DMC cotton of the same number. Free or even half price shipping can be a life saver. Going to check thread too! I do have a question, when you set work on fram not hoop do you make it as tight as possible as you place the tucks? Hi, Ruth – I’m not sure what you mean by placing the tucks? What kind of frame are you using? Hi, I am using the same ome that you have we ordered it from the store you recomended inCA and I must say the selection is great and service is even better! What I was asking is , when I place my cloth on the frame do I streach it as much as I can as I place the pins on the side to hold it in place? oh no! what a stash enabler! I loved their selection of gold work supplies, something I have struggled with here in NZ. Good pics which gave me a lot more confidence in buying on line. some of the Rococco fell into my cart too. Half price shipping, you say? (Back in a tic). I’m back! I’m such a sucker for gold threads *sigh* 😉 Just bought a bunch of different threads to try out – thanks for the heads up Mary. Now I’ll be impatiently waiting for them to arrive. Mary, I was wondering if you could put together a “list” of a ‘starter-pack’ of various gold threads for novices to try. I’ve searched various posts of yours prior to placing my order, but it would have been great if a ‘basics’ type kit of listed gold thread could be put together. E.g. commonly used # of smooth purl, bright check purl, pearl purl, twist, rough purl, smooth passing thread etc. Just a thought/suggestion as I know you are very busy with various projects and commitments. Thanks for all you do.